The Catalan government says an attack in the seaside resort town of Cambrils is linked to the vehicle attack on a popular Barcelona promenade that killed 13 people. Police earlier said two people who have been arrested were not the driver. The Cambrils attack involved five suspects who carried bomb belts. Police shot and killed the suspects and detonated their explosives. Police have given no details on the attack in Cambrils, but media reports say a vehicle hit a police car and people nearby. Six were hurt. The police force for Spain’s Catalonia region says the five suspects shot and killed in the resort town of Cambrils were carrying bomb belts, which have been detonated by the force’s bomb squad. The regional police said they cannot say yet how the civilians and police officer in Cambrils were injured. Local media have reported a vehicle crashed into a police car and nearby civilians and that police shot the attackers, included one brandishing a knife. This item has been CORRECTED to show that two of the wounded are in serious condition, not two of the suspects. People from Australia, Taiwan and Hong Kong have been confirmed among the injured in the Barcelona attack. Late Thursday afternoon, a van swerved through a pedestrian walkway in a popular tourist destination in downtown Barcelona, killing 13 people and injured an estimated 100 more. Authorities in Spain have said the dead and injured were from 24 countries. Australian Foreign Affairs Minister Julie Bishop says an Australian woman is hospitalized in serious but stable condition. She did not have details of the conditions of two men who were injured. Taiwan’s Central News Agency says a mother and daughter from Taiwan were slightly injured. The Chinese consulate in Barcelona posted on its website that a tourist from Hong Kong was slightly injured and that it had no other reports of Chinese citizens being hurt. The police force for Spain’s Catalonia region says the fifth suspect shot in the resort town of Cambrils has died and six civilians have been injured. The confrontation came about eight hours after a van swerved through a pedestrian walkway in a popular destination in downtown Barcelona, killing 13 people and injured an estimated 100 more. The regional police said they cannot say how the six civilians were injured at the moment. They earlier tweeted that they are investigating whether the Cambrils suspects were wearing explosive vests. Its officers planned to carry out several controlled explosions. The force says it is working on the theory that the Cambrils suspects were linked to the Barcelona attack, as well as to a Wednesday night explosion in the town of Alcanar in which one person was killed. The regional police said on Twitter early Friday that troopers fired on the five suspects in Cambrils, a seaside town about 100 kilometers (62 miles) from Barcelona. The regional police said in another tweet that they are investigating whether the Cambrils suspects were wearing explosive vests. Its officers planned to carry out several controlled explosions. U.N. Secretary-General Antonio Guterres is condemning the terrorist attack in Barcelona, Spain, and extending his condolences to the families of those killed. “The United Nations stands in solidarity with the Government of Spain in its fight against terrorism and violent extremism,” the statement said. In Thursday’s attack, a van barreled down a busy walkway in central Barcelona, swerving back and forth as it mowed pedestrians down. Thirteen people were killed and 100 were injured, 15 of them seriously, in what authorities called a terror attack. Spain’s public broadcaster, RTVE, is reporting that the suspects shot and killed south of Barcelona may have been carrying suicide explosive belts. The broadcaster said the suspects tried to carry out a similar attack to the one in Barcelona, which left 13 people dead earlier Thursday, by driving a vehicle into pedestrians. It said seven people were injured by the suspects, two seriously. The channel ran a video of Cambrils’ promenade in which volleys of gunshots could be heard while sirens wailed and people’s screams could be heard. Police in Spain say they have shot and killed several people south of Barcelona while carrying out an operation in response to a terrorist attack. The regional police for the Catalonia region said on Twitter early Friday that officers are in Cambrils, a seaside resort town about 100 kilometers (62 miles) from Barcelona. They called on people in the town not to go out on the streets. Spain’s public broadcaster, RTVE, is reporting that regional police troopers have killed four people and injured another. The broadcaster says police suspected they were planning an attack in Cambrils just hours after a van swerved onto a pedestrian promenade in Barcelona, killing 13. A senior police official in Barcelona has confirmed that regional police troopers have shot and killed the driver of a vehicle that drove through a police checkpoint and struck two officers. However, Major Josep Lluis Trapero of the Catalonia region’s police force says the driver is not thought to have been involved in the van attack that killed 13 people earlier Thursday night. He says a female officer who was run down by the vehicle suffered a broken leg. Hours after the van attack on a downtown pedestrian plaza, the police force for Spain’s Catalonia region had said that a car hit two officers at a traffic blockade on the outskirts of Barcelona. Barcelona police said that after running the checkpoint, the vehicle and its driver were intercepted about 10 kilometers (6 miles) outside of the downtown area where the original attack happened. That’s when the driver was shot and killed. Spanish Prime Minister Mariano Rajoy says his country is mourning in solidarity with the city of Barcelona and other cities in Europe that have been hit by deadly extremist attacks. For Spain, Thursday’s bloodshed was the country’s deadliest attack since 2004, when al-Qaida-inspired bombers killed 192 people in coordinated assaults on Madrid’s commuter trains. Rajoy declared three days of mourning across Spain. The interior chief for Spain’s Catalonia region says three days of mourning have been declared to honor the victims of the van attack that killed 13 people in Barcelona. Interior Department chief Joaquim Forn says the death toll could increase since at least 15 of the 100 people thought to have been injured in the attack were hurt badly. The government in Spain’s Catalonia region has revised the death toll from the van attack in Barcelona back up to 13. The regional interior department said late Thursday that 15 people were seriously injured in the attack at the central Las Ramblas district. Another 23 were moderately wounded and 42 people were lightly wounded. The injured are being cared for at various hospitals. Top officials in Belgium have sent wishes of solidarity to the victims of the van attack in Barcelona, including one Belgian. Foreign Minister Didier Reynders noted that one Belgian national had been killed in the attack, and he sent his government’s condolences to the victim’s family. Greece’s foreign ministry says a Greek woman has been injured in the van attack in Barcelona. It didn’t say how severe the woman’s injuries are. The Islamic State group has claimed responsibility for the van attack in Barcelona that officials say killed 12 people and injured many others. The police force for Spain’s Catalonia region says a car knocked down two police officers at a traffic checkpoint in Barcelona. The Mossos d’Esquadra force did not indicate if the incident was related to the van attack in the city’s Las Ramblas district on Thursday that left 12 people dead and dozens injured. Barcelona police later said in a tweet that the car and its driver were intercepted about 10 kilometers (6 miles) outside of the downtown area where the original attack happened. Local media reports said a white Ford Focus ran over the officers and that a person from the car was shot and killed by regional troopers. Neither the city nor regional police have said whether a suspect was shot. This item has been corrected to show that it was local media, not police, saying a suspect had been shot and killed after two officers were knocked over at a checkpoint. The president of Spain’s Catalonia region says police have arrested two people in the van attack in Barcelona’s bustling Las Ramblas district. Carles Puigdemont also gave updated casualty figures during a brief news conference Thursday night. Puigdemont says 12 people are confirmed dead and at least 80 have been hospitalized since the van jumped a sidewalk and swerved through a busy pedestrian area. The region’s interior minister had tweeted earlier that 13 people had died in the attack. A speeding van struck pedestrians in Barcelona’s Las Ramblas district, killing at least 13 people and injuring more than 50 others. Pope Francis is praying for the victims of the Barcelona van attack and expressing his closeness to their families. Vatican spokesman Greg Burke says the Argentine pope was “greatly worried” about Thursday’s attack and is following developments closely. The Vatican has greatly increased security for Francis’ public events to prevent similar truck assaults on crowds that throng to his weekly audiences and Sunday blessings in St. Peter’s Square. The main boulevard leading to the piazza has been closed to traffic for well over a year. Britain’s prime minister says that the “the U.K. stands with Spain against terror” following the van attack in Barcelona that killed at least 13 people and injured dozens of others. Theresa May condemned the “terrible” attack in which a speeding van struck pedestrians in Las Ramblas. The attack in Barcelona comes after similar vehicle attacks in London this year. France’s president and the mayors of Paris and Nice are among the French dignitaries offering support for Barcelona after a deadly van attack. Nice Mayor Christian Estrosi, whose Mediterranean city lost 86 people in a truck attack during a Bastille Day fireworks display a little more than a year ago, announced that a special homage to Barcelona’s victims would be held Friday. President Donald Trump is condemning what Spanish authorities say is a deadly terrorist attack in Barcelona. The White House has said Trump — who is on a working vacation at his private golf club in New Jersey — is being updated on developments by chief of staff John Kelly. Trump’s wife, first lady Melania Trump, tweeted her “thoughts and prayers” to Barcelona before the president. At least 13 people were killed and at least 50 injured after a van was driven onto a sidewalk and down a pedestrian zone in Barcelona’s historic Las Ramblas district. A regional government official in Spain says 13 people have been killed in the van attack at a historic shopping and tourist area of Barcelona. Catalan Interior Minister official Joaquim Forn also said on Twitter that more than 50 people were injured during Thursday’s attack. Regional police now are evacuating stores and bars in the Las Ramblas district. U.S. Secretary of State Rex Tillerson has offered assistance to authorities in Spain as they investigate the van attack that left at least one person dead in Barcelona. He says U.S. diplomats in Spain are currently assisting Americans there and asked those who are safe to notify friends and families. Tillerson says the United States would never relent in tracking down terrorist suspects and holding them to account for their actions. The police force announced the arrest on Twitter Thursday evening. It denied earlier media reports that officers had a suspect surrounded in a bar. Meanwhile, the region’s interior minister is calling on residents to remain indoors and avoid unnecessary travel while the investigation continues. Spain’s public broadcaster says a suspect in the Barcelona van attack has been arrested. State-owned broadcaster RTVE reported Thursday night that a man was detained a few hours after a van drove into crowds in the popular Las Ramblas district. Police have not confirmed an arrest. A private Spanish news agency, Europa Press, reported that police were looking for a man named Driss Oukabir. The news agency says he was suspected of having rented a van connected to the attack. It wasn’t clear if that person is the man who was arrested. RTVE says investigators think two vans were used — one for the attack and a second as a getaway vehicle. A Barcelona broadcaster is reporting that a man thought to be the driver of a van that drove into pedestrians is held up in a bar that is surrounded by police. Barcelona’s Tv3: also reported Thursday that the Spanish passport of a person of Moroccan origin was found at the scene of the attack that police say has left at least one person dead. The television station says police have surrounded a bar called Rey de Istanbul. Police haven’t confirmed they have a suspect cornered. Barcelona’s El Pais newspaper reported earlier that police were seeking more than one suspect in an unnamed bar. Meanwhile, a regional government official says all public festivities scheduled in Barcelona are temporarily canceled. A government official in Barcelona says one person has been confirmed dead and 32 others injured in the van attack in the city’s historic Las Ramblas district. Media in Barcelona are reporting that up to 13 died in the attack. Barcelona police said on Twitter that 10 of the 32 people injured were seriously hurt. 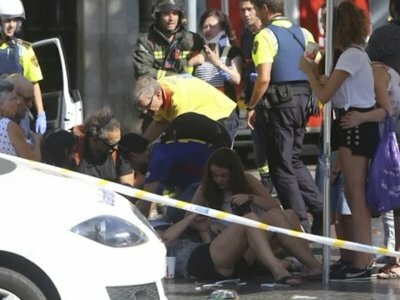 A van mounted a sidewalk in the popular tourist area of Las Ramblas, slamming into a crowd of pedestrians on Thursday afternoon. The White House says President Donald Trump has been alerted to the unfolding situation in Barcelona. Chief of staff John Kelly is aware of the developments and is keeping the president informed. Trump is on a working vacation at his private golf club in Bedminster, New Jersey. His wife, first lady Melania Trump, sent her “thoughts and prayers” to Barcelona via Twitter. Police in Spain have confirmed fatalities after a van slammed into pedestrians in Barcelona’s historic Las Ramblas district. Police in Spain have confirmed they are investigating the van incident in Barcelona as a terror attack, while local media reports say that up to 13 people have been killed. A van slammed into pedestrians on Thursday in Barcelona’s historic Las Ramblas district, which is normally packed at the height of the summer tourist season. Media outlets, including Cadena SER radio station and TV3, are reporting up to 13 dead. Other reports had varying death tolls. An official death toll has not been issued. Barcelona resident Keith Fleming says he was watching television in his building on a side street just off Las Ramblas when he heard a noise and went out to the balcony to investigate. He says he saw “women and children just running and they looked terrified.” Fleming heard a bang, possibly from someone rolling down a store shutter, as more people raced by. The American living in the Spanish city says police arrived and pushed everyone a full block down the street. He says the officers still are there with guns drawn and riot police stationed at the end of the block. His street now is deserted. Police in Spain have confirmed there are fatalities after a van slammed into pedestrians in Barcelona’s historic Las Ramblas district. Catalan police tweeted that “there are mortal victims and injured from the crash” without specifying numbers. The Barcelona-based La Vanguardia newspaper is reporting at least one dead and 20 injured. A van jumped the sidewalk in Barcelona’s iconic Las Ramblas area, slamming into pedestrians. At least five were seen lying on the ground on the popular tourist street. El Pais newspaper, citing unnamed police sources, says the two perpetrators are holed up in a bar in central Barcelona. Various local media reports have called it a terror attack, but authorities haven’t officially confirmed it. Spain’s El Pais newspaper says that Barcelona police are treating the van crash as a terror attack. Authorities say a van mounted a sidewalk in the iconic Las Ramblas area of Barcelona, slamming into a crowd of pedestrians. Local media reports say there are several injured. El Pais newspaper, citing unnamed police sources, also reported that the perpetrators are holed up in a nearby bar. Some local media have reported bursts of gunfire. Barcelona police, in a tweet, told people to stay away from the center of the city because of a “large contingent of security forces and emergency services” deployed in the area. Spain’s El Pais newspaper, citing police sources, says the two perpetrators of the van crash in Barcelona are holed up in a bar. A van mounted a sidewalk in the popular tourist area of Las Ramblas in Barcelona, slamming into a crowd of pedestrians. Local media say several people have been injured in the crash. A white van jumped the sidewalk in Barcelona’s historic Las Ramblas district on Thursday, crashing into a summer crowd of residents and tourists and injuring several people, police said. In a photograph shown by public broadcaster RTVE, three people were lying on the ground in the street of the northern Spanish city Thursday afternoon, apparently being helped by police and others. Videos of the scene recorded people screaming as they fled. Police in the northern Spanish city of Barcelona say a white van has jumped the sidewalk in the city’s historic Las Ramblas district, injuring several people. In a photograph shown by public broadcaster RTVE, three people were lying on the ground in the street Thursday afternoon and were apparently being helped by police and others. Police cordoned off the broad street and shut down its stores. They asked people to stay away from the area so as not to get in the way of the emergency services. A helicopter hovered over the scene. Police in the northern Spanish city of Barcelona say a white van has jumped the sidewalk in the city’s historic Las Ramblas district. They say on their Twitter account that several people are possibly injured. In a photograph shown by public broadcaster RTVE, three people were lying on the ground in the street and were apparently being helped by police and others. Police say on their Twitter account there are possibly several injured. The El Pais newspaper said several people were left lying on the ground. Police cordoned off the street and shut down its stores.